Trained as a painter, Antonio Visentini had an association with Consul Smith which began around 1717, and led to his production in 1735 of a set of engravings after Canaletto’s series of views of the Grand Canal in Smith’s collection. Visentini was also to act as an architect and general artistic factotum for Smith until the latter’s death in 1770. Visentini and Zuccarelli were able to collaborate with perfect harmony in this commission. Zuccarelli - who painted the landscape settings and most of the figures - had the easier task since he could work freely from his imagination, and the landscapes in which he sets his English buildings are in no way different from those he was used to painting for his pastoral scenes, while the figures are those of his contemporaries in Venice. Meanwhile Visentini - who painted the buildings - had to provide accurate renditions of buildings that he had never seen and of which he only had plans and elevations. 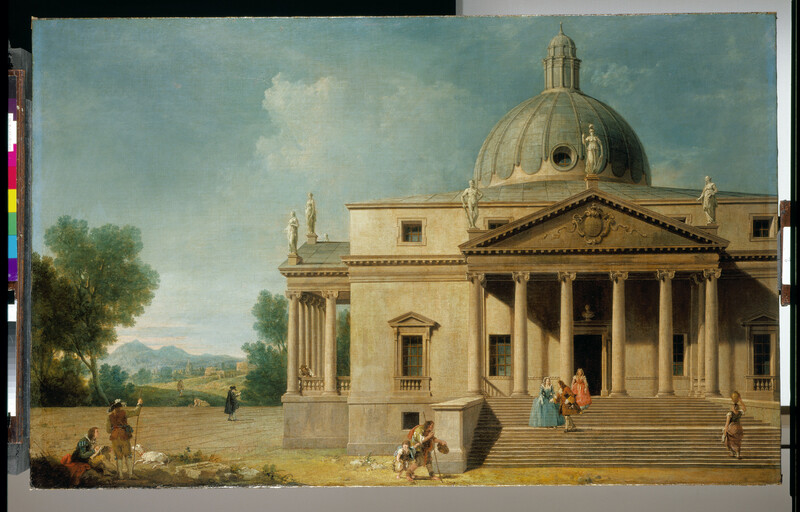 The Palladian prototypes for these English buildings, most of which were in the Veneto, could have assisted Visentini in his work to ensure that he gave them a convincing, three-dimensional quality. This would certainly have been the case with the present view of Mereworth Castle in Kent, which was a direct copy of Andrea Palladio’s Villa Rotonda near Vicenza. Mereworth was designed by Colen Campbell for John Fane, later 7th Earl of Westmorland, and was complete by 1723. Catalogue entry adapted from George III & Queen Charlotte: Patronage, Collecting and Court Taste, London, 2004.